Ravenscourt Park Hospital was designed by architects Sir John Burnet, Tait and Lorne as the Royal Masonic Hospital, a new hospital for the Freemasons. It later became a private hospital, was leased to the NHS in 2002 but has been closed since 2006. 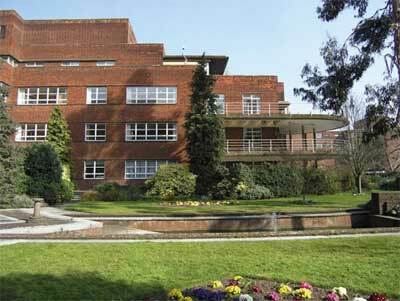 The original hospital buildings and gardens were laid out with fine Art Deco detailing, the landscaping in front of the main entrance integral with the design of the boundary wall and entrance. To the south and overlooked on 3 sides, the garden was laid out with lawns, planted with numerous shrubs, conifers and flower beds, with a central elongated rectangular water feature with fountains and lilies. Took part in Open Garden Squares Weekend in 2006. From the early 1900s, there were plans to relocate the existing Freemasons' Hospital in Fulham Road, Chelsea to Ravenscourt Park but this did not take place until 1932/3. The hospital site, adjacent to the west boundary of Ravenscourt Park (q.v. ), was formerly that of a substantial house built when development of the Ravenscourt estate was taking place. The hospital's foundation stone was laid in the presence of four members of the royal family 'by electrical connection' from Olympia. The Wakefield Wing was added in 1958 but the 1930sre-brick Art Deco buildings are largely intact. The hospital was later taken over as The Stamford Hospital, and then became the independent Ravenscourt Park Hospital. In 2002 it was leased to Hammersmith NHS Trust as a means of cutting waiting times, but then closed in 2006 due to a drop in demand and rising costs. The front landscaping has cast concrete raised beds, a wall with a seat, and low edging walls to the beds. Further planting of shrubs is found around the hospital buildings, also edged by low brick walls. At the south of the main building, the 1930s garden has fine mature trees, dense shrubs and the water feature overlooked by hospital rooms with semi-circular balconies.